Every day nurses are required to make ethical decisions in the course of caring for their patients. Ethics in Nursing Practice provides the background necessary to understand ethical decision making and its implications for patient care. The authors focus on the individual nurse’s responsibilities, as well as considering the wider issues affecting patients, colleagues and society as a whole. This third edition is fully updated, and takes into account recent changes in ICN position statements, WHO documents, as well as addressing current issues in healthcare, such as providing for the health and care needs of refugees and asylum seekers, bioethics and the enforcement of nursing codes. This publication from the International Council of Nurses is the essential resource for nurses seeking to understand ethical decision making, written by world experts in nursing ethics. 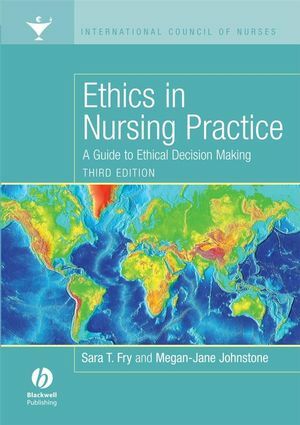 Sara Fry is the author of Ethics in Nursing Practice: A Guide to Ethical Decision Making, 3rd Edition, published by Wiley. Megan-Jane Johnstone is Professor of Nursing and Director of the Centre for Quality and Patient Safety Research at Deakin University, Australia. Part 1Preparation for ethical decision making. 1Value formation and value conflict. 2The discipline of ethics 1. Beyond traditional theories of ethics and principlism. 3Ethical concepts for nursing practice. Early standards for nurses' ethical behaviours. Development of nursing codes of ethics. Functions of a code of ethics. Common themes in nursing codes of ethics. Application and enforcement of nursing codes of ethics. 5Ethical analysis and decision making in nursing practice. Models for ethical analysis and decision making. A model for ethical analysis and decision making in. Part 2Ethical responsibilities of the nurse. Part 3Applying ethics to nursing practice. Serving people who need nursing care. Respecting values, customs and spiritual beliefs. Protecting human rights and dignity. Delegating nursing authority to others. Accepting responsibility for nursing care. Implementing desirable standards of nursing practice and nursing. Participating in research involving human subjects. Equitable social and economic working conditions in nursing. Cooperating with nurses and other co-workers. Appendix 1Teaching ethics to nurses. Appendix 4 ICN Code of Ethics. • Written by acknowledged experts in nursing ethics.